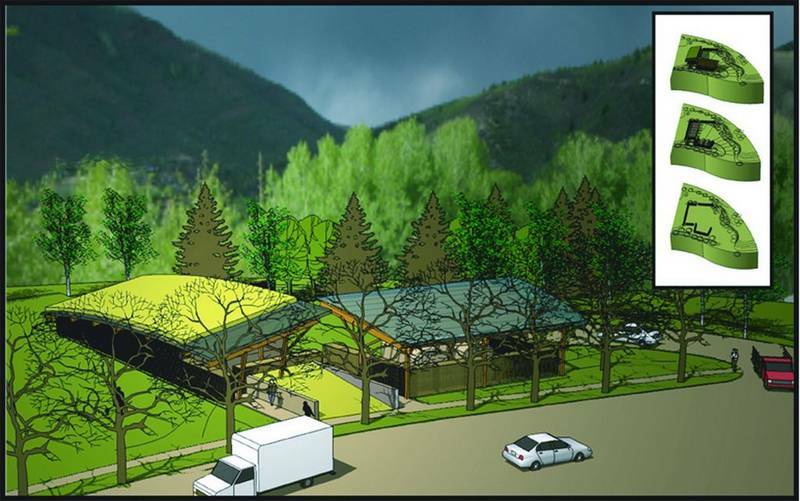 Referendum 2C asks voters to grant the city of Aspen final land-use approval to build a covered facility, illustrated above, at the site adjacent to Rio Grande Park. The wind turned a small twister of dust, stirring up scraps of paper, coffee cups and plastic and blowing them across the open area of Aspen’s recycling center Saturday. Most recyclers agreed that something must be done.Referendum 2C asks voters to grant the city of Aspen final land-use approval to build a covered facility on the site of the recycling center adjacent to Rio Grande Park.Proponents of the project say the proposed structures and amenities are long overdue and will make the recycling center handicap-accessible and more efficient. They ask voters to look closely at the plans (available online at http://www.aspenpitkin.com).Opponents of the proposal say money earmarked from the nearby Obermeyer Place project could be used to pave and landscape the existing facility. They want it to remain an open-air center with no buildings, and cite problems with a proposed single-entry to the center as well as safety issues with the adjacent skate park.Cost estimates for the project are $750,000. Half of the money would come from Obermeyer Place developers based on an agreement with a city; $50,000 would come from a grant, and the rest would come from city tax dollars. The city approved the project in June after a COWOP process, which includes citizens in the planning process. But opponents collected a sufficient number of signatures to get the issue on the November ballot.On Saturday, local recyclers were mixed on the question. But most agreed something needs to be done to improve the facility.Aspen resident Mark Ilich supports the referendum. He said that if the facility is built as proposed, it would be a “long-term viable solution” and would encourage people to recycle more.”It’s not cheap, but it’s worth it,” he said.”There is more misinformation out there than I can believe,” said Aspenite Carol Carr, as she looked at site plans. Carr moved to Aspen in June and visits the center twice a week. She said the proposed project calls for “sheds” not “buildings” and believes the project would be more functional and aesthetic than an open-air facility. Joel Mischke, who owns Basalt Bike and Ski Shop and is busy opening up a new outlet in Aspen, said he relies on the center.”It makes me feel better about myself,” he joked, while recycling cardboard.A Basalt resident, Mischke cannot vote on the measure, but he supports the referendum to build a new center.”I certainly think it would be an improvement,” Mischke said of the proposed buildings.Of course, maintenance is the real problem, he said. People don’t know how to use the center properly; Mischke hopes whatever facility goes in gets used, and used properly. “People dump trash and leave plastic bags and paper bags in with the plastic recyclables,” he said. The ideal would be to have an attendant, but as a business owner he knows the expense and difficulty of adding staff.Michael Miracle is the managing editor of Aspen Sojourner magazine. Though he has regular curbside pickup of recyclables, he said it is just as convenient for him to drop by the center. “I still haven’t made up my mind,” Miracle said of the referendum. He called the current site an eyesore, but said there are convincing arguments on both sides of the issue. The current facility is not up to Aspen’s high standard, and Miracle is worried that someone in a wheelchair would have a hard time using the facility without improvements.Miracle said the referendum is not an “either or” vote. He hopes that if the recycling center referendum is defeated at the polls, the city uses the money from the Obermeyer project to make some kind of improvements.”We’re going to do the best we can with the outcome,” said Sarah Laverty, environmental project coordinator with the city of Aspen. If the referendum fails, there might be some aspects of the new design that would be used in later projects, she said. But it would be back to the drawing board for the city: perhaps another COWOP process or city officials would create a plan for council and then public approval.